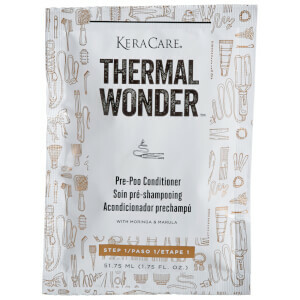 Treat your hair to the nourishing and purifying properties of KeraCare Thermal Wonder Cream Cleansing Shampoo, a conditioning shampoo that performs a gentle cleanse on hair and scalp to eliminate dirt, impurities and flaky, dead skin. 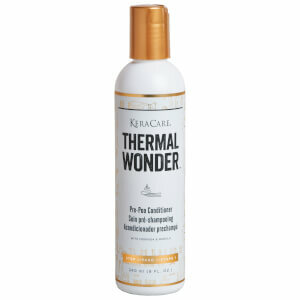 It expertly prepares hair for thermal styling. Banishing grime without stripping natural oils, the hydrating shampoo contains a host of fresh botanical extracts and moisturising ingredients, including Moringa and Marula to improve hair and scalp hydration whilst facilitating smooth combining to reduce damage and breakage. Promoting a comfortable scalp and soft, silky tresses, it combines Vitamins, Menthol, Aloe Vera, Green Tea that protect, revitalise and purify. Hair feels silky smooth and the scalp feels clean and refreshed. The second step in your Thermal Wonder™ routine. Apply liberally to wet hair and distribute evenly. Gently massage into scalp. Rinse and repeat. 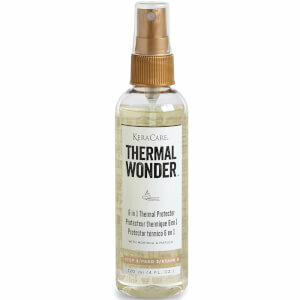 Towel-blot and proceed to thermal styling with the Thermal Wonder™ 6 in 1 Straight Styler. Aqua/Water/Eau, Disodium Cocoamphodipropionate, Trideceth-7 Carboxylic Acid, Aloe Barbadensis Leaf Juice, Linum Usitatissimum (Linseed) Seed Extract, Disodium Laureth Sulfosuccinate, Cocamide MIPA, Betaine, Acacia Concinna Fruit Powder, Glycol Stearate, Camellia Sinensis Leaf Powder, Keratin, Hydrolyzed Keratin, Phytosterols, Moringa Oleifera Seed Oil, Sclerocarya Birrea Seed Oil, Lagenaria Sphaerica Seed Oil, Avena Sativa Kernel Oil, Tocopherol, Fragrance/Parfum, Menthol, Citric Acid, Hydroxypropyl Methylcellulose, Polyquaternium-10, Polyquaternium-7, Sodium Benzoate, Caprylyl Glycol, Phenoxyethanol, Propoxytetramethyl Piperidinyl Dimethicone, Benzyl Salicylate, Butylphenyl Methylpropional.